Instead we just walk to DOTS store to buy pure vanilla and an assortment of spices including saffron, clove, nutmeg in the shell. As soon as we returned to the port terminal, it started to rain again so we stayed on board. They built a new pier and a nice port terminal with lots of stores. As you get outside, you'll find vendors selling spices. I was told or read the first time I was here not to buy the spices from the vendors on the street. That's why I made my way to Dots who is very famous for her store. As you get out of the terminal, turn right and walk toward the stairs going up the hill but don't climb them instead walk on the right thru the tunnel and on the other side follow the street and turn right again toward the water then turn left and you'll see the sign, a yellow circle saying Dots Plaza. 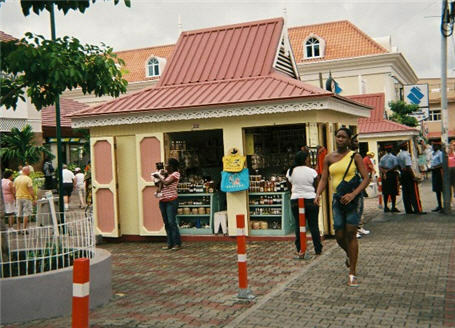 Grenada is called the "spice island" and it's the best place to buy your supply of spices at a very low price. Which one can you buy? Nutmeg, Cinnamon, Clove, Ginger, Allspice, Bay Leaf, Black Pepper, Bird Pepper, Turmeric or Saffron, and more. And pure vanilla, not extract like we have at home, and much cheaper! If you want to take a watertaxi, once you exit the port terminal, turn left and you should see signs for them. As you walk the pier from the ship, you can see them on the left. They are very cheap and can take you to the beach. A funny thing happened this morning at breakfast. A lady approached our table and asked if she and her companion could share the table. We said fine and started to talk. We asked where she was from and she said Montreal and we said we live in Hudson (30 minutes from Montreal) and her face dropped as she is also from Hudson, our little town of 5,000!